Students: You've Got The Power! What does it mean when someone says, “You have the power?” Is there something they are trying to get at? What comes to mind? Do you immediately think back to the electronic pop hit that rocked the 90s US Billboard charts by German music group, Snap? I do! Haha and I was born 6 years after that song was released! (What a great time for tunes that was!) I also think of the famous words Uncle Ben engraved in the yearning hearts of dreamers and Marvel fans alike, when he leaned in to tell Peter Parker (spoiler alert: Spider-Man), “with great power comes great responsibility.” When I think of the concept of power I also think about French and Raven’s five bases of power, because my coursework covers that in great length…and I think about our senators and student body. In the Student Government Association this phrase has become somewhat of its own cliché that has an implied level of importance, but perhaps a misunderstanding of the ‘how, where, and why’ of that importance. In SGA when we talk about power, we mean more than just senator power to recess our meetings, to recommend changes to bylaws and resolutions, to alter or table funding requests, and make elaborate parliamentary motions….in fact, one of the things we are trying to get at is this idea of an empowered level of influence that comes from having privileged information and a setting in which we can discuss that information and come up with solutions given what we know! It largely has to do with knowledge and the opportunity, ideally, to make well informed decisions as a result of having it! This is important, but it has the chance to become more important if we consider the pervasiveness of that type of power. Our mention of power considers the opportunity for the decision making to expand past the UC ballroom on Monday nights at 8pm, when senate meets, through the dissemination of the knowledge we learn to others for consideration and consultation, i.e. peers, cohorts, faculty, staff, other university entities, and or pets-if you think they’d have an interest in learning about university affairs and stuff. Additionally, I’d like to think that we can’t talk about power without acknowledging that ‘capability’ and ‘potential’ are also included. It’s my belief that power, regardless of if you are a senator or not, flows as a transformative, dynamic entity, rather than something static and overhyped. However, power can only be reflected in a progressive and productive state through action. Action is the lifeblood of power. 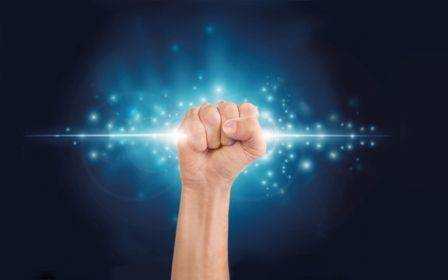 Without it, without momentum, power loses its energy. Dr. Vargas would know this better than I would, but in physics, power is something that is measured. It is the amount of energy put out or produced in a given amount of time. I think it can be easy to forget or wrap our heads around the idea that we have power, let alone fathom the plethora of ways in which we can execute it. This can be especially true if we don’t determine ways to measure or monitor our power; like in physics. 1.) POWER IS SOMETHING YOU HAVE! 2.) YOU HAVE A MULTITIUDE OF WAYS YOU CAN HARNESS WHAT YOU POSSESS! Especially if you are inquisitive enough to want to learn ‘how, where, and why’! 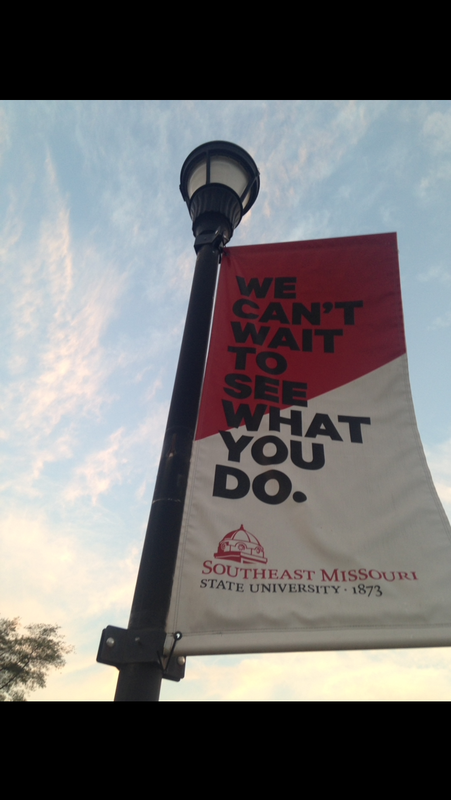 As much as a particular title may be perceived to have position power and significance to make change, it shouldn’t come as a surprise to know that at Southeast Missouri State University your ‘title’ as student is enough to have someone be vested in your thoughts and feelings. After all, being a student means you are a stakeholder and therefore have a voice. I mean your general fees and tuition dollars are what allow us to have the type of institution we do! Therefore it is a little ridiculous to think that you don’t matter! The above gem of a photo hangs in the office of one of Southeast's coordinators. 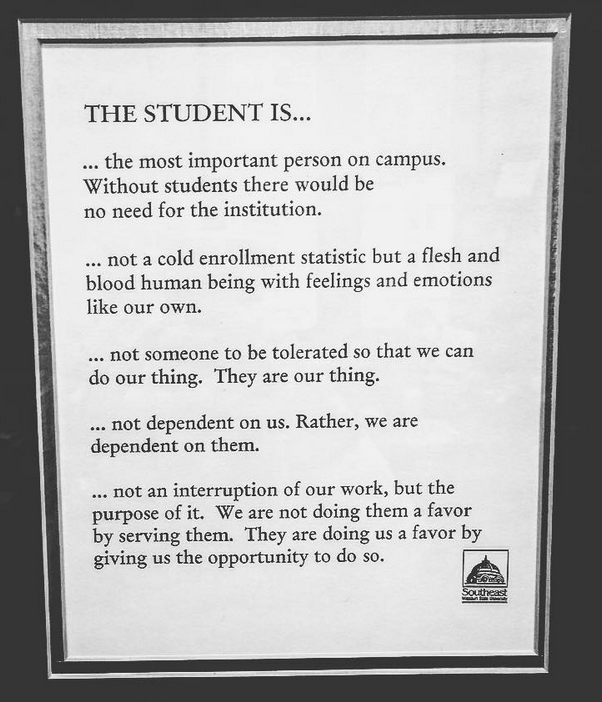 It proves to act a reminder for the way in which staff, faculty, administration, and even students should view 'the student' (prospective or current) at SEMO. Moving forward think about the type of power you have and consider how you may use it, not lose it! Also give "Power" by Little Mix a listen!